The patented Freshness Valve is the key to eliminating trapped CO gas. We suggest replacing your Freshness Valve every two months. The valve is constructed with a unique filter that allows carbon dioxide gas to pass through without allowing oxygen or other gases back in. This one-way valve removes the trapped gas that breaks down and destroys coffee flavor over time. One of the four factors that destroy flavor. All coffee is roasted, both whole bean and ground. This roasting process heats the coffee bean and caramelizes the sugars in coffee. It is this roasting process that creates the flavor degrading gas. Coffee is perishable much like fruit, milk or bread and keeping coffee fresh is very important. Without a freshness valve coffee can not be kept fresh. We suggest replacing your Freshness Valve every two months. 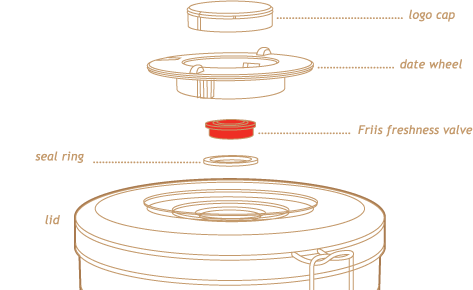 To help remind you, we’ve added a helpful date wheel to the top of your Friis Coffee Savor. This roating wheel is designed to help you set a monthly reminder to replace your valve on the appropriate day. Using your finger and thumb, move the date wheel to expose a numbered day. Once you set the appropriate day, you will automatically be reminded to replace your valve on that day. Some customers have written and emailed us with another idea for the date wheel - use it to mark the day you put coffee in your Coffee Vault. A helpful reminder of how fresh your coffee is. As always at Friis we guarantee "You'll Taste The Difference Within One Week" once you start using the Coffee Vault. Keep your coffee fresh before you brew. We have created an easy way to help with your Friis replacement valves. You can find a 12-Month Friis valve replacement kit available through our online store HERE. The replacement kit will last a full year. And the shipping and handling is always free. Subscribe to the Friis News HERE for special offers throughout the year and receive updates on how to receive your replacement valves FREE with special FREE shipping and handling. Review the replacement instructions here or view the helpful instructional video below. Open your Coffee Savor to reveal the underside of the lid. Using your finger or a pen, remove the spent valve by pushing on it until the valve detaches (sometimes the seal, cap and date wheel will detach) from the top of the lid. Close and lock your Coffee Savor. Reposition the dime sized white or black seal ring in the center of the lid if it has come loose. Insert a new Friis Freshness Valve with the white filter facing down and seat the valve securely. Reposition the date wheel and snap on the cap with the Friis logo facing up. Rotate the date wheel to set your replacement reminder date.